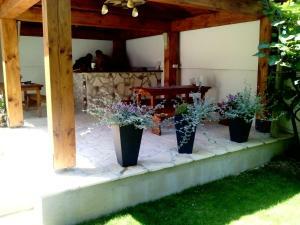 Boasting a garden, terrace and views of garden, Apartment Carmenn is situated in Poreč, 1.6 km from Poreč Main Square. The property is around 1.6 km from The Euphrasian Basilica and 7 km from Aquacolors Water Park Poreč. The accommodation offers a 24-hour front desk, and buying tickets for guests. All units at the guest house are equipped with a flat-screen TV with satellite channels and a kitchen. All guest rooms will provide guests with a microwave. Porec Marina is 1.3 km from Apartment Carmenn, while Žatika Sport Centre is 1.4 km away. The nearest airport is Pula Airport, 58 km from the accommodation. When would you like to stay at Apartment Carmenn ? This twin/double room has a balcony, tile/marble floor and patio. 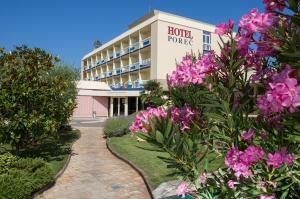 Please note that the check-in and key-collection take place at: Anke Butorac 3, 52440 Poreč. This property will not accommodate hen, stag or similar parties. Each day we'll check prices and send you an email for your selected dates at Apartment Carmenn. If you don't have specific dates but would like to check prices for say next weekend or say next month we can check the price too. Click to write a review and share your experience of Apartment Carmenn with other travellers.